Founded in 1959 at the University of North Carolina at Chapel Hill, Romance Notes is published three times per year. The journal welcomes the submission of innovative, interdisciplinary articles on Spanish, Portuguese, French, and Italian literature and culture. We highly encourage submissions that present original approaches to the study of gender and feminism, historical memory, literary history and theory, popular culture, film, colonialism and postcoloniality, postnationalism and globalization. Articles may be written in English, French, Italian, Portuguese, or Spanish. Articles should be 3,000 to 5,000 words in length, including all notes and works cited, and should consist of original material not published or under consideration for publication elsewhere. All articles should be accompanied by an abstract of 250 or fewer words. 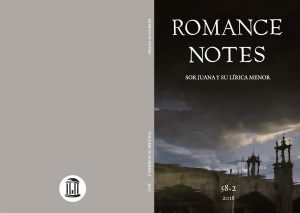 Romance Notes strictly adheres to the current MLA Style Manual (8th edition), with a bibliographic list including all “Works Cited” at the end of the essay. For more information on the MLA style, please refer to the MLA Style Center website (https://style.mla.org/). Another helpful online resource is the Purdue Online Writing Lab (OWL). Submissions to Romance Notes undergo a double-blind independent peer review process. Therefore, authors should not include their name or academic affiliation in the article text or abstract. We only accept electronic submissions via our Online Journal Systems (OJS) portal. Because our use of OJS is still relatively new, we appreciate your feedback on any technical issues or confusion you may experience. We have linked below three instructional documents to help guide you through the registration and submission process. Preparing your article based on these guidelines allows us to expedite and streamline the publication process, should your article be accepted. Once your work is submitted, we will acknowledge receipt via email. Evaluations are typically completed within 3-5 months. Upon acceptance for publication, each author must pay a subscription fee to Romance Notes and will receive one (1) print copy of the issue in which the author’s article appears, as well as an electronic file. The individual subscription price is $45.00, and the student subscription is $30.00. Institutions interested in subscribing to the journal may do so at $55.00 per volume year (3 issues). Back issues and single copies of the journal are also available for purchase at $25.00 + shipping. Romance Notes no longer publishes book reviews. Current issues may be accessed electronically on Project MUSE through subscribing libraries. Back issues are available on JSTOR. Journals past and present are also available to participating institutions from EBSCO and Cengage/Gale.